Does anyone remember the “Please” and “Thank you” song? Please and thank you, they are the magic words. No doubt. They can carry you far in life. But there are two words that can make amends, change destinies, and heal hearts. My sister Mess Cat pointed out to me the other day that we say it way, way too much. I think our text conversation looked something like this. Me: Hey. I’m sorry it took me so long to get back to you. Busy doing blah blah blah. Sorry. MC: Oh I’m sorry. Didn’t mean to cut into that. Just needed to ask about blah blah blah. Me: Okay, no problem. I think that’s fine. And sorry, no, you weren’t disturbing me. And so forth. I think you see the pattern here. Yes, we say it. A lot. 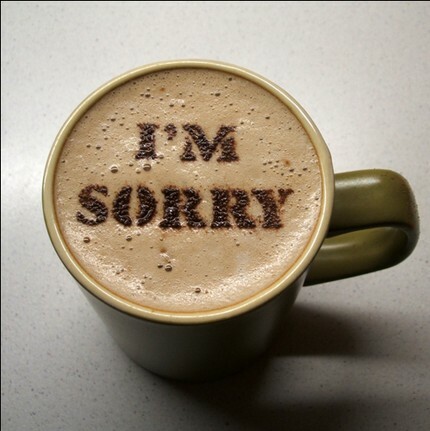 Maybe we are making up for the deficiency of “I’m sorry”‘s that exists in our world. That or you know how sometimes folks give you a gift that they would have like to have had themselves? Yeah, that. I’m for serious, sometimes if folks, those whom I live with and those whom I only come across in the day to day would just say I’m sorry, it would make a world of difference in the relationship and in my outlook on the world. I’m talking to you, grocery checkout clerk. I know you didn’t mean to drop my apples all over the floor. (And yes, I did almost apologize to her that my bag tie came loose. It’s an illness, and I’m seeking help.) But when you picked them back up and were going to send them home with me, banged up and all, that really hurt my feelings. And when I asked if some could be replaced and you said two and sent me all the way back to produce without ever ONCE uttering any kind of apology…..Hurt. Feelings. I know you didn’t mean to, and I would have made you feel all kinds of okay about it if you had just said those two words. But you didn’t, so I didn’t, and I left frustrated and with a bad taste in my mouth. And with more banged up apples than good ones. And to the salesman who promised my children a remote for that blame DVD player, what’s up? For months you have called to see if I had anyone to refer to you. Each time I asked about the remote, you said you were on it, check again later. But when I showed up and asked you about it, all of a sudden you’re telling me I have to pay for it. It was one of the higher ups who actually apologized and made it right. You just continued to look at me fearfully like I was going to have some kind of hormonally induced breakdown. But never once did you say “I’m sorry.” I so would have forgiven you. But for now, yeah, that’s right–no referral for you. It’s not always that petty either. People from my previous life who misjudged, spread untruths, and in general made things worse–an apology would be a good place to start. Family. Friends. I know it’s not easy. And I know I haven’t always said it when I should. I regret that. And I’m sorry. Really. I think it’s interesting and important to note that one of the steps of healing in a twelve step program is “to make amends” with folks one has “harmed.” It’s as healing for the person who says it as it is for the person who hears it. Who sometimes really needs to hear it. I’m sorry says a couple of very important things. It says to the other person, You matter. You exist and have rights just like I do. You matter. And it says, I respect you and I care about what just happened to you. I regret my part in the whole thing. It shows the other person they have been heard. And sometimes that’s all we are asking for. For a while my children seemed programmed to reply, when one or the other was compelled (or coerced) to apologize to another, “It’s okay.” That was an acknowledgment, “I hear you. I hear your apology. We’re straight. It’s okay.” The more I thought about it though, I decided to put a stop to that. It’s NOT okay that you took her doll and hid it, or you called her a name, or you just knocked the fool out of him (whether you meant to or not–ahem). Instead they are learning to say, “I forgive you.” And sometimes it takes the apologee a moment or several to reach the point of replying with that. And that’s okay too. As long as they eventually reach that point. At least in this house. Grace abounds and so does forgiveness. You just need to ask for it. Just as the apology helps both sides, so does the forgiveness. If grey is the new black, perhaps I’m sorry can be the new “Please” and “Thank you.” Please and thank you can open doors and help you make friends, but I’m thinking I’m sorry can unlock the doors slammed shut and help you keep your old friends. Just a thought.